On Tuesday school buses will fill the street but on Saturday night Saratoga Speedway is going to make sure a couple of them never pick up another student as they are having a back to school special by running their first ever school bus demo derby. 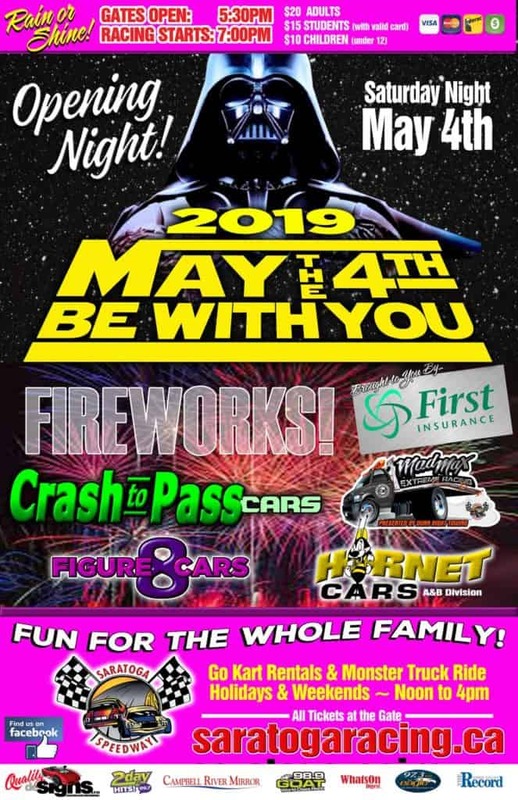 The special event will see school buses doing their best to destroy each other in a action packed night at the Black Creek oval that will also feature Crash to Pass racing along with the Road Runners, Mad Max and Hornet cars. With only 5 weekends left in the 2017 season 4 of the 5 divisions have tight battles for their points championship with only the Hornet A’s point leader having sizeable lead with Carter Hintz ahead of Luke Dixon by 229 points. The Hornet B’s have the most drivers with a chance to be crowned point champion as only 85 points separate the top six drivers with Randi Joyce the current leader. Only 112 points separate the top three in the Crash to Pass division lead by Mike Jenkins while the Road Runners who have the most races remaining with 5 have Ryan Guest the point leader only 48 ahead of Austen Hack and the Mad Max has Danielle Antoink ahead of Damon Dunn by 60 points. Last Saturday night the Wilroc Sprint visited for the final time in 2017 and they were joined by the IMCA Modifiedes and Dwarfs cars for a fast paced night of racing. In Sprint car racing dash wins went to Brandon French and Duane Zienstra while heat race wins went to James Miller and Zienstra. The 30 lap green white checkered main event saw Miller pull off a emotional win as he dedicated the win to his dad Jim who was seriously injured 42 days earlier in a race in the states that saw him slam into the wall at full speed that left him in a coma and is still in the hospital healing. The younger Miller himself had a bad crash 2 weeks earlier in Victoria that destroyed his car forcing his race team to build a new car before Saturdays race making his win that much more special. While Miller was racing away to the win a three car battle for 2nd was happening behind him involving Mike Haslam, Courtenay’s Mike Meeres and Greg Sagmoen who would go wheel to wheel to the checkered flag with Haslam grabbing the position ahead of Meeres and Sagmoen. Saturday was also the last visit for the Dwarf cars and it saw Campbell River’s Stewart continue his home track dominance by winning the 20 lap main event that saw two cars heavily damaged on the races warm up lap. Other race wins went to Brad Struck in the trophy dash while heat race wins went to Braydon Auemen and Kyle Kennedy. The IMCA Modifides saw the return to local racing in a fill in roll by possibly the best driver to ever circle the Black Creek oval in Jason Beaulieu who took a clean sweep with qualifying fastest, winning the A heat and the main event. Beaulieu who has spent the past few years racing his dirt Modified in big events thru-out the States was behind the wheel of son’s Chris Modified and showed why he such a highly considered driver by easily winning the 30 lap race ahead of Dano Bryant and Jeff Monks who himself had a successful night by winning the trophy dash and B heat.